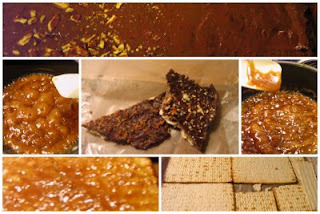 Check out Amy's blog for the recipe (http://adouble.blogspot.com/2009/04/chocolate-toffee-matzos.html). I used dark brown sugar, salted butter, and semi-sweet mini chocolate chips. For the toppings I tried a few different things. I topped a few sheets with chopped pecans, left a few plain, and topped the rest with a delicious cinnamon sprinkle mix from pampered chef. Yum!!! YAY! I'm so glad you made it and liked it! !